Voice of the Collector: Remember When A Guys Bowman RC Was Actually Worth Something? Remember When A Guys Bowman RC Was Actually Worth Something? For all the hype surrounding 2010 Bowman this is a perfect example of everything good and bad about The Hobby all rolled up into a single, currently over-priced product. So I am opening packs and will be doing a full review and Video Highlights piece later, when I find a Jason Heyward rookie card. Cool!! Was my first reaction, and then I reminded myself to not get to excited as it 1) isn't shiny, 2) doesn't have a colored border with 3) serial numbering or 4) an autograph, meaning that in all essence it's completely worthless. Isn't there something wrong with that? Remember when a guys RC was a coveted piece of cardboard distinction, especially a Bowman RC at that? Instead, the card is relegated to the ho-hum bin. It's really sad if you think about it as this guy is showing the potential to be a tremendous, long-term player for the Braves. I guess I shouldn't say they are totally worthless. I mean, a dollar is still something right? However, I hope you see my point. I know times change, and I'm not trying to live in the past but the industry side of The Hobby is trying to recapture the haphazard magic created in 2001 with the base RC's of Albert Pujols and Ichiro Suzuki, right? The problem is that a culture has been created that unless a player's rookie card has any of the above characteristics, it's just another base card. I've recently developed the opinion that for the RC logo, and therefore "official" rookie cards to mean anything, the Bowman brand has to go. Most collectors are only looking for the autos and parallels anyway. 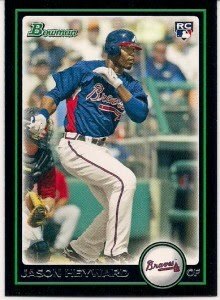 I don't think Topps would kill off Bowman, but that's what needs to happen. I bought this card for $3.49 (includes shipping)- The first week bowman was out this is about as low as you could get the card. It was going between $5-7. Ah, those were the days. A base Travis Lee, Kerry Wood, and Jose Cruz, Jr., were as good as it got! It's a shame, really. I still like pulling good players' RCs, but I'm not chasing them like I used to. A Lincecum, Longoria, Joba or whoever is just a nice added bonus to whatever else I might be chasing. When 1951? Even the 1992 set was full of players who wouldn't have true rookie cards for years.